Looking to clean that canvas top on your SRT10 or RT/10 but afraid to use regular soap or harsh chemicals? Look no further! This is the official MOPAR canvas top cleaner concentrate (add water) designed for your MOPAR top to lift dirt and bring your top back to life. Good for several washes! 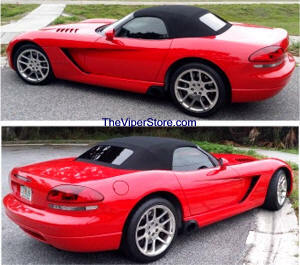 After market custom made - Brand new soft top for 1992-2006 Viper convertible. Includes new complete cloth top ready to mount on your frame. Uses factory original material. Does not include frame. Rear window with defroster sold separately.